Northfield News reporter Suzi Rook’s interview with Northfield Police Chief Gary Smith is in today’s paper in a piece titled Off the radar: Police Chief Gary Smith talks about the events leading up to his medical leave of absence. For almost 10 years, Smith has dealt with Type 2 diabetes, though it’s unclear whether that led to his chronic sleep apnea. Two operations last month, he hopes, will expand his airways enough to offer some relief. He also faces delicate neck surgery, a procedure that comes with some risk of paralysis. I still don’t understand why he’s not talked publicly about these health problems till now, evidently not even with his own staff. For weeks he prepared, gathering verbal background from his investigators, he said, looking for verifiable information on the scope of the city’s heroin problem. The information he released at the press conference – the number of users, the apparent age range of addicts, even the allegations of teenagers duping Mayo Clinic patients out of their prescription painkillers – came from his staffers. Despite the verbal evisceration he took, Smith said he’d do it the same way all over again, believing the press conference was the right thing to do. I can understand why he believes the press conference was the right thing to do. But there’s nothing in the article about the way in which he went about the press conference, ie, no involvement/communication/planning about it with the superintendent of schools, the mayor, the city administrator, or any of the Rice County Chemical Health professionals. It’s that lack of collaboration that fueled much of the backlash and undermined his stated goal of alerting the community to our evidently unique heroin problem. When Gary Smith took his medical leave of absence, he was not sure what the problems were or the origin of the problems. He went through extensive testing in July and August to find out. As for the news conference on heroin, he obtained the information from the head of the South Central Drug Task Force, then Sgt. (now Captain) Roger Schroeder. The school district was, and still seems to be, oblivious to the problem. The Northfielder who robbed the State Bank of Faribault, bought thousands of dollars worth of heroin, then got busted in Northfield motel with enough needles to fill a 2 liter bottle–seems to prove the point. Can anyone do the math on how many hits of heroin were consumed during the party, which was attended, according the Northfield News storty, by local juveniles? Heroin busts are becoming increasingly common, frequently as part of routine traffic stops. No one knows the exact numbers, but we do have a serious heroin and oxycondone problem in this community. As I told Griff’s wife a few weeks ago, my brother used to be the tri-state drug dealer for the Hell’s Angels and the Sons of Silence, selling anywhere from $250,000 to $500,000 per week (about the only time those two groups would work together on anything). He had a drug habit of his own that cost thousands every day, and he based his “business” out of southern Minnesota. After going to treatment (a third friend of his had died in his arms from an overdose after buying drugs from my brother) he tried hard to get out of the scene but wasn’t very successful. Some of the gang members went so far as to kidnap him from North Carolina and later from Florida to get him back. He did spend about six years in prison as well. I’m saying this to give you a bit of background. Last year, while on vacation here, my sister was offered cocaine in a public place by a person she doesn’t know. Yes, she looks kind of like a hippie because she’s a grad student with more of the “natural” look but she was shocked that anyone would be so bold as to approach her in a public place and offer her drugs. I was embarrassed that it happened while she was visiting me. I have also been to establishments on Friday or Saturday evenings in this town when male friends have had to complain to managers/owners of establishments that there were other men in the restrooms doing drugs and didn’t want to move out of the way to allow them to use the sink for washing hands…believe it people, there is a problem. My father was an attorney and my mother a nurse. My other siblings and I are considered “successful” and have completed 4-year college degrees or better. This kind of thing can happen to any family. If the people in this town want to pretend there is nothing going on, I personally don’t think it’s a good tactic to take, but I really hope that they don’t try to shut down the people who are trying to get something done. There is a problem. It may not be quite as bad as the chief thought it might be, but I wouldn’t be surprised if he were close. Let’s not shut our eyes and hope that the monster goes away. Let’s turn the lights on and clear the place out. We’ll all live in a better place if we do. I’m at a client’s right now but I’ve approved the anonymous post above because I know the person who posted it and the request for anonymity is within our guidelines. David H, Perhaps Chief Smith’s insistence on going it alone would not be so objectionable if he didn’t lie about it. During his press conference, he said the reason for the timing of the conference was because he had to wait to get all the parties on board, when he hadn’t consulted with any of them. Why lie about it? (you can hear his exact words on the podcast of his press conference.) Also, his reason for the timing of the conference has changed. According to the last Northfield News article, Smith timed the conference to get maximum attention during the slow holiday weekend. I think that the idea that Smith is being attacked only for inflating the numbers of drug users is a “Straw Man” argument. I believe we have a large problem in Northfield, quite possibly as large as Smith claimed. I also believe that Smith has had some eight years to deal with the problem of increasing drug use and the resultant property crimes. It was during his watch that these problems exploded. His press conference exposed his thought processes and his tactics, and it just isn’t good enough. It is time for him to go. The chief said he prepared for the press conference for weeks, yet told Al Roder and the school sup. just hours before. Dave, Heroin busts are becoming common, but no one knows the numbers??? Why not? I can tell you how many books I sold on Saturday, but the police don’t know how many arrests have been made compared to previous years. The chief through out a wide range of numbers that did not jive with the high school’s numbers. I realize none of this is easy, but there has to be more clarity than we are being told. The leadership in this town has come off the rails and nobody in a leadership position can explain why???? It is frustrating to be a citizen and now it seems we are to blame. First of all, Curt, we need to be careful that we do not use the “questionable cause” fallacy in our logic. Secondly, to all, could it be that the Chief had a good reason for not including the schools and others in city hall before the press conference? (Or, I should say, “not including them” as they were made aware of it, just not in time to be involved.) It seems to me that he might have been purposly excluding them because of his frustration with their history in addressing the issue. Finally, it is interesting to hear from David that our acting Chief Schroeder was the one who came up with the numbers. Let’s quit trying to pretend that the problem does not exist, and, instead, use our time and energy to create opportunities that give youth a reason not to use. Christine, if Chief Smith has a good reason for not consulting others in his decision to hold a press conference, he is free to tell us what that reason is. He has no good reason for lying to us, pretending to have consulted with others when he didn’t. Griff, I have a blogosphere etiquette question for you. When you blog about something you have a financial interest in, you disclose it. What do you think about David Hvistendahl blogging on behalf of Chief Smith? Is some disclosure called for? I assume that most people know that Hvistendahl is Smith’s attorney, but surely not all are aware of that. I hope David keeps blogging because I enjoy his feisty point of view, but I think some disclosure might be in order. Curt: Did the Chief say that he consulted with the schools and city hall? Christine, I don’t know if Smith said he consulted with the schools and city hall prior to his conference. Please listen to the podcast of the press conference linked here at about the 27:30 mark. This is when Smith points out the various groups that he says got on board with his “NIMBY” program. Smith says that part of the timing for the press conference was getting the various pieces in place, when he hadn’t actually consulted with any of the various pieces about his “NIMBY” program or his upcoming press conference. The first time anyone heard about his program was in an email which arrived shortly before the conference. Curt, you shouldn’t judge Chief Gary Smith. If I started digging into your life I probably would find something you said that might be perceived as a lie. Also David H. never said he was blogging on Gary Smith’s behalf, so get your facts straight. There is a drug problem here, and instead of being in denial about it I’ve chosen to be part of the solution. True. Maybe you could find something in Curt’s past. Curt, however, isn’t a public official in a highly-visible leadership position making a broad statement about the state of a community’s public health particularly as it relates to illegal activities. Public officials should and must be held to a higher standard in regards to their public statements. To not do so is to leave yourself wide-open to manipulation and control. Curt pointed out serious inconsistencies in what the Chief has said over the past couple months; instead of questioning Curt’s statements, you chastise him for the act of confronting. You say you’re “part of the solution”. That statement, combined with your previous allusions to knowing something about the Chief’s allegations about Al Roder (in a different LocallyGrown thread), and your subsequent lack of follow-up commentary, make me believe that you a) either want to be seen as an insider without the burden of ever having to prove yourself so; or b) you have some connection or desire to have a connection with Chief Smith for whatever reason; or c) both. Or perhaps, d) you’re a private investigator. If you believe you are part of the solution simply because you chose to believe what Chief Smith said, I would argue that’s an ineffectively low threshold to “solving” anything. How do you so easily assert that Curt (and, I’m guessing, others that agree with him) are “in denial”? Why is questioning statements that were not and have not been backed up by any real hard evidence a sign of denial? Not believing what you were told is different than denying the truth. Denial means knowing the truth and ignoring it. In this case, to be in denial about the heroin problem in Northfield vis-a-vis Chief Smith’s statements would mean that you knew he was right – that there were “150 – 250” Northfielders aged 15-23 using the drug – and you were conveniently ignoring it. On the other hand, to question the Chief’s claims means, simply, to say: “Prove it.” He’s making the claim. It is his responsibility, as a public official, to back it up. If he does so, I will believe him. He never has. Despite anecdotal evidence, personal stories, and the occasional news story, no one has been able to substantiate the claim, including those who should be able to do so. Despite David Hvistendahl’s assertion that numbers were gathered from one of Smith’s subordinates, these “numbers” still haven’t been shared publicly. Jim Haas, with Rice County, has probably gone further toward showing some real data, albeit with numerous qualifications as to what can be inferred from such numbers. It is maddening when those who have chosen to believe the numbers Smith offered (for whatever reason: anecdotal, personal experiences, some inside information) refer to those who do not believe the same thing as “being in denial”. It’s possible to both question statements and be a part of the solution. In fact, sometimes, that’s exactly the best way to start solving a problem. As I and numerous others have stated, working with bad data or with exaggerated claims can actually make a problem worse. I think the analogy I used, way back in July, is using a firehose to put out a match. It works, but everyone else gets wet. Does Northfield have a drug problem? Most likely. Does almost any community not run by a dictator? Yep. The solution? Target the dealers. Treat the users. Get families directly involved. Work with as many organizations as possible. Marshal your resources responsibly. I’m sure that’s what Smith wanted to see, but the way he went about it was divisive. Even being divisive would have been fine, but he was unable to back it up. It’s okay by me if he stepped on a few toes and didn’t involve other organizations, but, if he was going to do that, then it should have been even more imperative to him to back it up with solid evidence. Although drug problems in Northfield have not effected me directly, I’m sure they exist. Labeling those who do not believe claims that have yet to be substantiated as “in denial” does nothing but drive people apart. People who, I’m sure, all would like to see the problem solved and, therefore, should be working together. Jeez, things seem to get heated up whenever I have little time to deal with them. Curt, good point about Dave Hvistendahl being Gary Smith’s attorney. I should have caught that. Dave, I know you’re not blogging for Gary, but it would help for people to have a confirmation from you that your his counsel. Lisa, it’s fine to disagree and even be angry but telling Curt to “get your facts straight” is an unecessary put-down and referencing “digging into your life” can easily be misinterpreted as threatening, if not by Curt, then by the hundreds of others who are reading along. Curt’s making a case for what he believes was a lie on Smith’s part. It’d be better to listen to the audios and make your case as for why you think it wasn’t lying. And to everyone… it’s really important to be very civil in your remarks here, as it’s a very sensitive issue. WOW! Brendon I guess I stepped on your toes. I have kicked out 42 dealers & users out of the apartments , and turned them in to the police dept. I am doing my part , and I am researching all the allegations. I want facts, and I refuse to waste my time bickering about some of the issues. I can handle your insults & others. Have a lovely day! There’s one thing I hate about this process: if people would have the courage to say what they say here, to their ward rep, or at the open mic at the city council.. then maybe there would be less angry frustration here. I made a statement to the council at the last open mic ( I’ve done so many times before) but this time I was really apprehensive because of recent attitudes to citizens at open mic. They need to hear, in public, from more people who are dissatisfied/questioning the process. They need to be more responsible to their role as OUR elected officals; they’re too much on their own political agendas. Every council person should be holding ward meetings until some of these controversies, and infighting, are cleared up. Insults? Outside of hinting that you might be a private investigator, I can’t figure out how I insulted you. Interesting take on my comments. Were these “42 dealers & users” in the 15-23 age range? Were they all dealing or using heroin or OxyContin? Were the dealers and users that you turned in to the police all actionable cases? If you “want facts”, why do you believe statements (Chief Smith’s) that have never been established as such? On one hand, I can see where your experience with these people has contributed to your belief in Smith’s statements. That makes sense. I’m glad you are actively working on these issues. On the other hand, I can also see how your terse response is more an attempt to get out of acknowledging or even trying to understand my argument. Instead of agreeing or disagreeing and offering a rationale, you resort to begging off the discussion and dismissing my reasoning as a waste of time. By stating that you “stepped on my toes”, you take credit for a more persuasive argument than you offered in your first post. Quite the opposite. It wasn’t persuasive. Your first post aroused my ire only because it so glibly dismissed those who didn’t think like you, those that weren’t “part of the solution” as you saw it, as being in denial. I see this as a very absolutist interpretation of a complex problem. I’ll restate, people who remain skeptical have some very good reasons for remaining so, as I outlined in my previous response, and it does not equate with denial. They want the same thing – reduction of dangerous drug activity in the community – that you do, but they want the real story too. They can work on better solutions if they have better information. Sorry, my response was to Lisa’s (#14). Not Kiffi. If it doesn’t matter who believes you, why contribute in the first place? Seems you’re coyly avoiding the issue. If you’ve ever heard me speak, you’d realize the reason I don’t speak at open mic sessions is that I don’t need a mic, open or not. I’m loud. Plus, my posts here are most definitely what’s on my mind about this issue. Well, that, and other, cheekier things that I post on my own happily perverted blog. If you want to see how loud I am, come to Glengarry Glen Ross at the Arts Guild theater this weekend. I’m plenty loud during that play. Okay. You don’t want to engage, and my wife has instructed me, for whatever reason, not to engage anyone else either. So, ciao to you, too. I wonder if now would be a good time to consider explicitly prohibiting any police officer or police chief for calling press conferences without the approval of their “civilian” supervisor. The only exception I would make is solving an already completed crime. 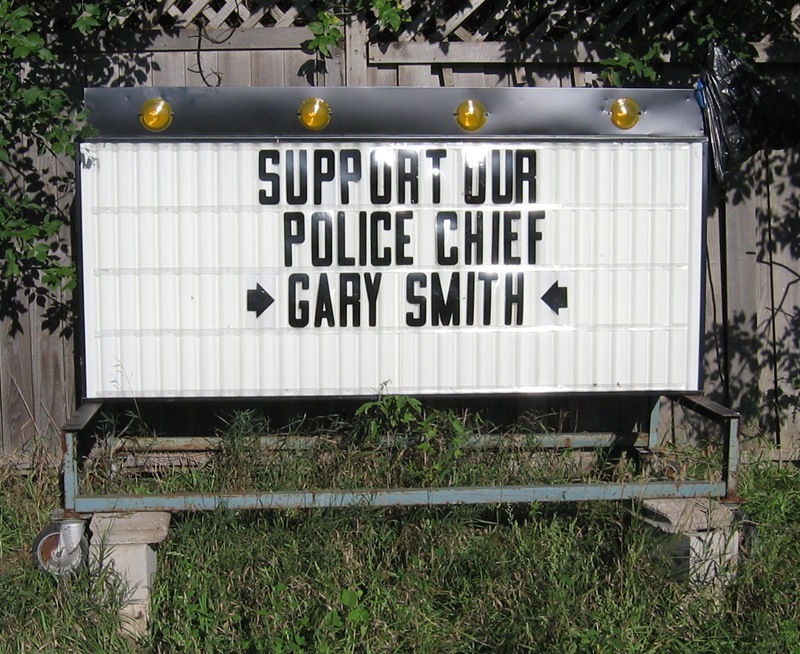 It is disheartening to me to see Chief Smith say that he would be it the same way again. Even if the extent of the problem is eventually verified, it seems fairly clear that there are multiple ways the press conference could have better and more effective. Approval of his supervisor, more concrete and verifiable data, and community leader support are several of the ways. Maybe its the media who is also anointed (I was going to say, with skills – I’ll stop at responsibilities) that has the overarching role of fact checking – and the power of Editorial. Maybe? No, it is! Personally, I’d like it if the Editorial position of the N-News was out front of… or thoughtfully picking up the debris created by front page articles on the same subject… as opposed to be piggy-backing on loose journalism. If I were the paper king – and I wanted to sell papers and serve the community too… I’d take on the local Blogs and the bloggers. Now, there’s fertile ground. Drive the letter writers to the Blogs and take them on in a show and tell. Shades of Romper Room for Adults! Acerbic retorts rule the day. Etters goes wild… law suits abound. Makes one wonder if the reporters are leading the Snews’ Editorial position. In any event, back to David L’s calling for shutting off the Chief’s verbal flow… I don’t see it as particularly advantageous for any one element of the political and civil leadership to have de facto censoring power over any of the others. This is not an affirmation of Gary Smith – more, it is a sense that you have to be able to trust the hired and elected leadership. When that’s not part of the deal… it’s time for a new deal! Thus it is, In the case of the Fourth Estate… it is particularly devastating when they seem to bring their weaknesses and bias to both the Front and Editorial pages. At this point I should ask David L two questions. 1) Which of the past three (lets go for past four) City Administrators he feels were particularly invested in the community’s greater good as evidenced by their “on stage” performance, and what they left behind. I’d even broaden the field and ask for a show of hands on any of the past 30 elected officials – CAVEAT – You can’t vote for yourself. 2) Can you recall the local paper ever playing a leading role in pursuit of better government? My point(s) are three. 1) there’s little gold in them hills. 2) There’s less trust in those who are elected. 3) The pickin’s are slim. But that’s what makes PeytonField what it is… that and the colleges and the Downtown. I checked in from Ecuador to see what’s new and everyone still is bogged down in whether the heroin numbers are real and the meaning of a comment from a podcast three months ago…so sad, and yet not surprising. In most communities, a key group of citizens comes together and leads, encouraging people, working with government and bringing real ideas to the table with the enthusiasm to get them done. In Northfield the energy seems to be focused on an endless stream of criticism of anyone and everyone. Imagine a community where you have to forbid the police chief from holding a press conference…how about having a city where the police chief would be working so closely with everyone else that the issue would never come up??? I believe the former and current administrators came here with high expectations of investing in the community, but left after it became clear that nothing would get done and they would be shredded in the process. I can tell you that the attitude in Eden Prairie is far more effective and open than here, and there are far larger problems and more numerous factions to balance. And the pay is better. Let’s face it, Northfield always will be a training ground for newer professionals, so local people need to run their own city…simple as that. I am not suggesting taking valium and tuning out the problems. The dog park got done because key people made it happen. The soccer fields were a true community effort. People are getting things done, but they aren’t willing to deal with the hassles and criticism of doing things through City Hall or running for office. It also seems that a generation of leaders who did so much together are nearing retirement, but don’t have a new generation of leaders to take over. It seems the Chamber and NDDC and League of Women Voters and Rotary and the PTOs and arts and sports folks could convene a town meeting and create a civic 5-year comprehensive plan for community improvement. In maybe three or four meetings, people could outline the main projects they’d like to see done and then divide up the work to get them done. City Hall? Library? Ice? Hwy 1, Hwy 19? A YMCA? A theater? There is some give and take in priorities, but everyone gets something out of the plan by agreeing to work on everything together. I have heard state and county officials say Northfield doesn’t get as much as it could in road and other projects because it doesn’t have a clear plan and doesn’t coordinate with other communites. Mill Towns Trail proves it can happen. We just need to replicate that formula in other areas. In the process, the leaders who have done so much in the past but are ready to pass the torch could identify the next generation and mentor them. In five years, some projects could get done, some coordination could be gained, and we would have some leaders who are not afraid to run for office and deal with the problems there. Or we can be here five years from now, reading books about Iowa, wondering who leaked that damned packet to the News and replaying podcasts backward to find the secret phrase that proves Target never should have been built here. Griff stated one of the problems fairly well in the original post. “It’s the lack of collaboration that fueled that fueled much of the backlash and undermined his stated goal of alerting the community to our evidently unique herion problem”. In other words, the press conference didn’t work. The other part of the backlash was fueled by the lack of any credible verifiable evidence to support the allegations made, especially considering the forum. I think everyone, including the Police Chief, would be better served, if we used this experience as an opportunity to ensure that subsequent press conferences have more collaboration, and more factual evidence. Given that the Police Chief has said that he would still do it the same way, then either the City Council or the Police Chief’s supervisor, the City Administrator, should make it clear that there won’t be a next time. It is a puzzle to me that no one has even acknowleged post #3 from someone who it told her own real story of her Heroin experience in Northfield. She was a new comer and really had no connections here. I still think the heroin issue is more important then the how and why it was reveled. Post #3 was pretty startling to me. No one is ever going to agree about what, how, or why it should have been comunicated… it is too late anyway. There have been quite a few posts of people’s real experiences… if it were me and I wrote from my heart and risk putting it out to everyone… I certainly would be disapointed that it was just ignored. I would think “what is the use”… no one is listening anyway. It’s hard to respond to a post like that, because it’s a bit different from the usual third-party disinterested chatter. The impression I get is that there is a real problem, and that this real problem has been somewhat lost in the shuffle because the claims made looked like they’d slipped a decimal place. I think this is a problem worth investigating and doing something about. I’m not sure where to begin. But, one thing is, it might help to get some better feel for what the actual scope is. Two junkies in Northfield? Whatever; if they leave me alone, I don’t care. Two hundred high-school age junkies in Northfield? That’s a major, major, issue. But somewhere in between those are some real numbers, and some real impacts, that could deal with being looked at. I moved here because my previous neighborhood was pretty much trashed by drug dealers. I don’t really care to repeat the experience. I agree with Robbie #24 that the how and why are not the main issue. Whether there is 2 or 200 heroin addicts, dealers,”junkies”… doesn’t matter. It is a definite problem. (The two would become 200 if not dealt with) So, what do we do? I believe we all want to help. I am not sure that 2 would necessarily become 200. I’ve known a few different sorts of people who used various drugs, and not all of them struck me as particularly bad neighbors. Pushers are a problem. Many users aren’t, except insofar as they tend to provide work for pushers. After listening again to the Chief’s press conference, it seems that he had been observing the situation for a few years and saw that it was getting progressively worse. It seems it was also an effort to jump start his NIMBY campaign and bring the issue out into the open. Many times he mentioned the word “will” in reference to what would be included in the NIMBY campaign. The word “will” being significant in that he was looking to the future. This word stood out to me as many have accused him of saying that he collaborated with the schools…. I heard him say that the information he had was coming from his staff, nearby treatment centers, and the area drug task force. When you think of it, wouldn’t they be the most likely ones to know? I agree with Robbie that the numbers or the way they were presented are not the issue. The issue is that we have a problem. However, I have not heard one person who is personally involved in the drug issue say that the numbers are not possible. Whatever the numbers are, the Chief made it clear that without active participation from the community, the issue would only get worse. Someone mentioned that the users are not the problem. Listen again to the press conference. The users many times become the pushers to support their own habbit. Right now I think Northfield has the image of putting their heads in the sand, pretending an issue does not exist, and/or covering up issues for fear of what people might think. And we are a town proud of our educational opportunities? Christine, I don’t understand why people would say that Smith collaborated with the schools. The schools weren’t aware of Smith’s impending “NIMBY” program or press conference. On June 22nd, Griff made a blog post, siting a report from the Hazelden Foundation that mentioned a heroin problem in Northfield. The blog post got hundreds of responses, Northfield was abuzz. Twelve days later, Smith held his press conference. In the Northfield News article, Smith says he conducted an investigation that lasted “weeks”. I have a feeling that the investigation took about twelve days, but maybe I’m just cynical. I heard from a Northfield policeman that as far as he knew, no one at the NPD besides Schroeder was aware that a press conference was going to happen. The “NIMBY” program was news to the the rest of the NPD. I agree that the problem is real. I just don’t think Smith should be part of the solution. I’m guessing that Curt’s analysis (#29) of how and why the press conference got called is fairly accurate. What I don’t understand is what the “solution” was (is) that was (is) being proposed by the police department. I don’t see how the community can work on solving the problem if we don’t have a firm grip upon the severity of the problem. It’s not fair to ask the Chief clarify his numbers given his health issues. But, I do think it is fair and it is incumbent upon Cpt. Schroeder to help the community understand the extent of the problem. Curt: I guess I should have said that people think the Chief SHOULD have consulted with the schools…. As far as information on the extent of the problem, I do not think that would have helped. However, after reading your post and thinking more about the situation, I think that how the community was going to address the issue should have been a more communal effort. I am not sure I agree that a NIMBY philosophy was the best way to do it. If the Chief had more input and collaboration with others in the community before he announced how the community was going to deal with the situation, we might have more people getting involved, instead of all the questions. The problem might have been that, because of past experiences, he felt the schools… would not want to acknowledge that it was a problem. Consequently, he felt he was on his own in finding was to address it. Is the whole 300 comment heroin thread starting over here? Then I’d like to say I am really disturbed by the NFNews on-line article today about the Drug Dog Search at the high school last night. Of course i realize you don’t announce that you’re going to do that; but I consider it such a breach of faith to do it at all, when the last impression given by the district was that they were not ready to take that step. Now maybe that changed, and not having kids in the system I just didn’t know, but at various community meetings the impression I got was that there were many kids and adults who all felt it was a pointless exercise, for all the reasons stated at the time. Many more youth and adults against the idea than supportive of it. There was a policeman at one meeting at the NCRC who was pushing really hard on the issue, not getting any support, and then ALMOST berating those who did not agree. I would really like to know how people feel about this. I personally am deeply annoyed that the school district would spend any money of their hard earned public tax share on such a fruitless and inconclusive endeavor. every cost involved… then a cost benefit analysis, and a result benefit analysis. We need scarce tax dollars spent on programs for the families and kids with drug problems, not on pointless dog searches. Employ skilled therapists and clinicians, not dogs. Kiffi, I do not know how I feel about it. I am glad that no drugs were found, but I am concerned that the results will be used as evidence that there is not a problem. Christine- Good thought in post #33 regarding how the results will be interpreted. This is a little like going in to the doctor for a check-up. It can be worrisome beforehand, but when nothing is found, you can rest assured until the next check-up. The good question here is how do we stay healthy in between the check-ups. I’m concerned that there is an attitude in the community that everyone else needs to get their head out of the sand, but it’s ok if I keep mine there. One case I would like to point out is an opinion expressed in another stream on this blog. It is the idea the we shouldn’t be raising a bunch of tattle-tales. My greatest concern with this comment is that it came from a youth program leader. There is a cry for cooperation from everyone, but if young people do not keep up their part in reporting use/abuse, then we parents have to resort to “drug dogs” and other means to get this out in the open. For people to cry “foul” with this is counterproductive to the process. It is like the young people (and some older ones) are setting back saying, “There is a problem, here, but I dare you to do anything about it!” I remeber, when I was small, and got a splinter in my finger, It hurt like crazy to get it out. But once it was out, the wound could actually heal. Gary Smith, in his news conference, was pointing out, “Hey! We’ve got a splinter here!” Now that we know about the splinter, are we going to leave it there to fester or are we going to pull it out? And, I’m not sure that education on the veracity of different types of splinters is going to do any good. Does anyone have a good set of tweezers? Mr.George: I take strong exception to you saying that thinking drug dogs are pointless in this application is denial, “crying foul”, or any other type of burying one’s head in the sand. If you had been working with youth programs , in this community, for twelve years, as I have, you might have a better perspective on the when the youth opinion is right on, and when it needs to be tempered with an understanding of the youth’s perspective. The kids know a LOT more about the reality of the drug scene in our town than the adults do. They know a lot more about the drug use at the high school than we do. Sometimes they choose to share that information, and sometimes they choose not to divulge what they know. If adults want to be foolish enough to damage trust, and go on pointless endeavors just to prove they are “doing something”, IMHO, those adults are misguided. The kids said over and over that kids who DO have drugs in school do not keep them in their lockers; that is the only thing this dog search has proven. Kiffi- I think I have a few credentials in the area of young people. I (and my wife in each case) have raised 5 children. We have had 7 or 8 young people live with us in the 11 years we have been in Northfield, and we have had the pleasure of mentoring many others. Three of my children are teachers (two college level), one nurse, one landscape architect. Of the other young people, one is in full time mission work overseas, one nurse, one IT manager, one photographer, most of them married & w/ children, all with higher education. Some of these were straight off the street and some were simply away from their home situation and needed some parenting. They all are employed, productive members of society. One of the things that made this successful is the concept of transparency. In my post, I was reacting to the youth leader’s concept that hiding information about drug use/abuse is acceptable. I say it is not. I still contend that if there is a universal approach to living openly, then there is no need to hide this type of stuff. Life is not a Disney movie where the kids are protrayed as super wise and mature and the adults are protrayed as bumbling idiots. We adults need to stand up and walk in proper relationship with the young people. The young people need to understand that there are certain behaviors that, if they do them, they are not going to get away with it, and we adults have the authority and responsibility to ferret out illegal behavior. Reporting someone on drugs is not going to get them into trouble. They already are in trouble. This is not a violation of their trust. Trust is violated when we make a commitment and do not carry through with it. As far as taking drug sniffing dogs into the school, I’m not convinced that this is the most effective means of prevention, either. I do believe we, as adults in this community, have a right and responsibility to uncover illegal behavior when we know it is going on. If anything, this is at least an open demonstration that we are serious about drug use/abuse, and we intend to do something about it. Can we be successful to the point of zero abuse? I highly doubt it. Can we make a difference by trying? YES!! My point was simply that a predictably pointless dog search was a waste of money that could be used to support productive measures, and also broke an element of trust, and also has the POTENTIAL of giving the illusion of there NOT being any problem since nothing but smelly tennis shoes was found … thereby giving those who don’t want to openly deal with the problem an excuse for not doing so. Kiffi- When you said, “If you had been working with youth programs , in this community, for twelve years, as I have, you might have a better perspective…”, it came across to me as condescending. Then, I realized that you would not know about my involvement with the youth unless I told you. Now, you interpret my explaination as a ” lecture on the perfection of your worldview.” Hmmmmmm. I’m not sure how to react to this. It seems that you are just annoyed with my perspective and convictions. If that is the case, then this would be a good time to practice “tolerance.” I am going to challenge you on your positions, so get used to it. And I expect you to challenge me on mine, but at least in a civil and dignified manner. What kind of a boring discussion would this be if everyone had the same opinion? As far as the drug dog use breaking an element of trust, what is being trusted here? That no one will try to invesdtigate if these young people are telling the truth? If that is the case, then someone has their hopes in a fantasy. Every statement and action by our elected officials is being questioned and challenged right now. Why would these young people think they should be on some kind of pedestal and exempt from investigation? I don’t think that coddling these young people along for fear of offending them is a good tactic. You said that “kids know a LOT more about the reality of the drug scene in our town than the adults do.” If this is the case, why are they keeping it to themselves? And if you, through your involvement with these “kids,” are aware of things going on and not encouraging them to expose it, are you being a part of the solution or the problem? As far as the negative results of the investigation lulling some people into complacency, this is probably going to happen. I’m sure there are at least as many people out there trying to find evidence that the figures presented at the infamous news conference are wrong as there are people looking for evidence that the figures are right. Just because there are these factions, we should not abandone the investigation. Nor should we condemn efforts to find out what exactly is going on. What are the “productive measures” that could have been supported by the money that was wasted? The questions you ask of me, Mr. George, have been answered elsewhere on this thread. As to “tolerance” … as Anne said : some things are “in the eye of the beholder”. My apologies for neglecting to intervene on the sarcasm and put-downs in this thread. Time to tighten things up again. I got my ruler out. Knuckles will be rapped!